I don't think this is the same as you are requesting. JSX and HTML are two different things. Perhaps we should name it to angleBracketSameLine. @michaeljota I agree they are different things, but in this regard they can be "collapsed" under the same option I think, as the behavior is largely the same. @j-f1's suggestion for the name (change?) emphasis it. I don't think I've ever seen any markup language with the closing brackets on a separate line. I'd like to see angleBracketSameLine or some equivalent. The reason I personally write the closing bracket on the next line is that it makes it much simpler to work out what's an attribute and what's content. It also matches what people do in code and so we found it pretty simple to get our company to all adopt the coding style. @aboyton good point. But what about when you don't have content? Is what I do to reduce vertical space (or just put it all on one line). It also happens on Vue template. Closing bracket on the next line or same line is not important for this issue. Prettier provides this feature as an option for JSX but not for Angular or Vue. not include the end tag. Case 2: When I put > back to the previous line, the fold is include the end tag. There are two fold tag in Case 1, fist one is fold start tag itself, second one is fold the end tag. VS Code was right, but I think the Case 2 is best for me. It will be better, if there is a switch like TagBracketSameLine option for any kind of html parser. For me this is the most annoying prettier formatting. Specially in Angular it prefers to break lin on the bracket instead of on attributes. @stephen-dahl agree. The angle bracket hanging out there on its own line is never going to catch on. I've tried for the last month, but my mind still sees it as an error or a typo. IMO, js-beautify has solved the html formatting problem. Until prettier gets its stuff together, I'll be using that for my html. There’s not an option for that. If you just have that kind of thing once in your codebase, you can put a // prettier-ignore comment before the array to stop Prettier from changing it. My team won't let me adopt prettier for angular html templates because of this one. I think when there is an impasse of how should be the correct looking, an option to configure that would be great to attend everyone. It's a bit hard to enforce using prettier when issues like this exists. It's actually not hard at all. You just need to focus coding, and leave Prettier alone with the formatting. Is easier than you think. I'm sure that mentality works great for small, authoritarian teams, but when you have to convince 80 other engineers to adopt a new tool and it doesn't pass their sniff test because the code it produces looks way different than the code they've been writing forever, then the conversation goes nowhere. Tool selection is often a social tug of war on larger teams where the toolmaster gets stuck respecting some accidents of history in order to gain adoption. a new option similar to jsxBracketSameLine would save us so much time on waiting and discussing. While I agree with the mentality of "let the formatter handle formatting", this particular configuration is already an option. This request is to extend it to other similar markup. Please do add this option for .vue files, I really wanted to give Prettier a try and this lonely brackets all around my code are really giving me a hard time! Also my team hate > on a new line. Also we are working with VUE and VETUR extension but JSX options doesn't apply. wow, it's now 67 and counting! Unfortunately no responses from the prettier team? Please add this for html files this is a deal breaker for our team we will not be implementing to bad liked it otherwise. I'm also looking forward to this. Current behavior stops me from using it. /cc @vjeux what do you think? @evilebottnawi Sounds reasonable to add an option for it since we're already doing it for JSX. Will this work for .html and for .vue files? Currently I have to disable prettier whenever I work on vue files. @phifa You could set .vue files to be handled by another parser, like the html one. @mkapiczy You can configure the html spacing to ignore. 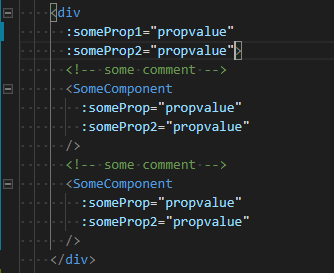 This is not about that, but about the closing tag when you have multiple properties in the element. @krokofant no that will not work since I want my script and style tags to be formatted by prettier.